A wonder of modern technology! 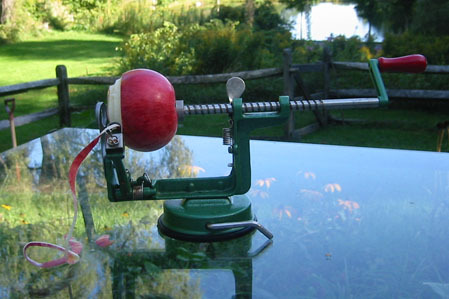 I’m not sure how modern this tool is but it peels, cores and slices an apples in seconds. This tool is a must have for anyone who has an apple orchard or even one apple tree. I have an apple tree! I’d love to have that one! It will be posted at 2am to coincide with my newspaper column. It’s also great if you use a mixture of fruit. 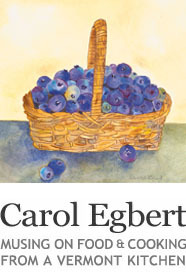 I used peaches with blueberries and also apples with blueberries. If you use blueberries you might want to add a couple of tablespoons of cornstarch to the sugar to thicken the juice a bit. So they do work! I’ve seen them in magazines… come to think of it I think my dad has one. What did you make with the apples? I made an apple crumb cake. I’ll post the recipe soon. i also used my new oven to make dried apples. Ohh… I LOVE these. I don’t have an orchard and never buy enough apples to warrant this purchase, but… they’re such amazing things!